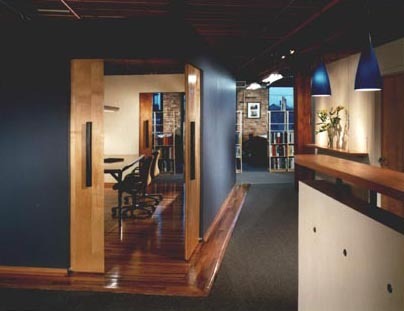 In 1995 an architecture studio and a design firm were relocating their offices into a recently renovated loft building on the north side of downtown Chicago. Located on one of Chicago's main arteries leading to the city's center, the site and its neighborhood are shifted off the urban grid. 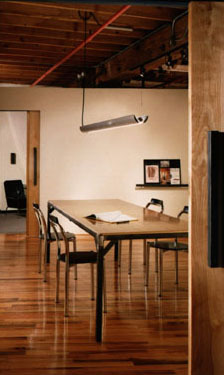 Taking this context into consideration, a layout, with the conference room as a focal point was established. Objectifying this room by shifting it back to the urban grid created a division in the space, allowing offices to be placed to the north and east. 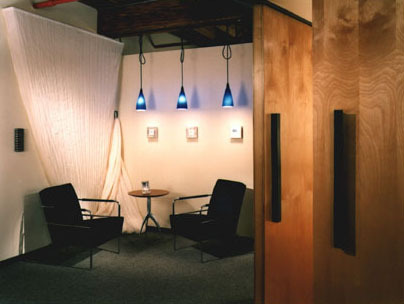 Upon entering the space, the client would be confronted with the conference room. The corner presenting itself to the visitor is the door into the room: when the door is open, the room is inviting and when the door is closed, the corner is uneasily close. This forces the visitor to make a decision, north to the graphic design office, or east into the architecture studio. The result of the design is an engaging sequence, where the client would travel from city (grid), into the office loft (off grid), and finally returning to contextuality, or the city (grid), coming full circle and resting.